When Sherri Meiklejohn, owner of Authentic Drilling in Colorado started out in the drilling industry eleven years ago, she never would have thought she’d one day be starting her own drilling company. According to the National Women’s Business Council, woman owned drilling businesses are categorized under the construction industry, and are recognized for making up less than 8% of women owned businesses. With few women choosing to head up professional drilling service companies it sparked my interest to ask Sherri exactly how she got her start, and what led her to where she is today. In a recent Q & A session, I was given the opportunity to ask Sherri many of questions looming in my mind about her new business, and below are her direct responses. As a woman, what made you decide to first get involved in the drilling industry? Back in 2004, I was approached by a Canadian seismic drilling company who wanted to expand operations into the United States. As my youngest child was starting kindergarten, it was good timing to go back to work. As with many small companies, one person must perform a wide variety of job duties. My duties grew from start-up setup, to accounting and field operations and I worked my way up to be the Director, US Operations. In 2008 I expanded my technical knowledge in the geotechnical, environmental and exploration drilling field which remains my business’ target market. When did you decide you wanted to start your own drilling company? I had lightly considered starting my own company in the past but as I have limited experience operating levers, I was uncomfortable with investing my savings in others hands. I finally came up with the solution, and it was to only hire senior drillers, pay them well and provide them with an incentive/accountability program by giving them a 25% net drilling profits bonus pool contingent on continued employment. How does being a woman owned and operated company affect your business? It is not any different than any other company. Every company has to prove their value to their clients and Authentic Drilling plans to do just that. You just purchased 2 CME drill rigs from Rig Source – What made CME the brand of choice? CME is a solid choice and is well known by our clients and drillers. Parts are readily available and they are very reliable drill rigs. How many units do you currently have in your fleet? We currently have three drill rigs: CME-75 truck, CME-550X and CME 55/300. We intend to purchase a CME-750X drill rig later this summer from Rig Source as well. What made you decide to choose Rig Source for your drill rig needs? Buying from Rig Source removes a lot of the unknown factors in purchasing a pre-owned drill rig. When the rig arrives, it is already painted in our company colors and other than tooling up the rig and giving the rig a once over, you can start your revenue flowing right away. What areas will Authentic Drilling service? 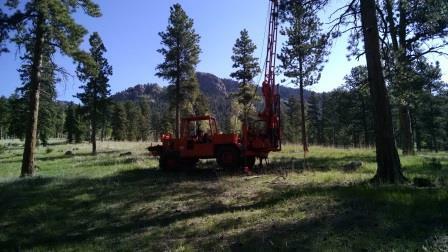 The CME 550X is drilling in the mountains today! Most of our work will be in Colorado and surrounding states, however, we will drill anywhere west of the Mississippi. As Authentic Drilling’s primary drill rig supplier, I want to thank Sherri for sharing her story with us and congratulate her new start with Authentic Drilling. Her story goes to show that smart business tactics really do help establish and build strong companies. If you are in the need of a used drill rig, give Rig Source a call today at 630.365.1649.